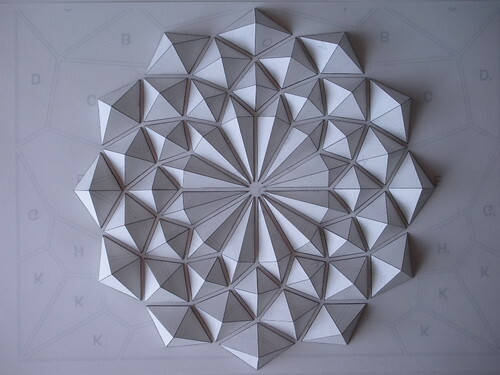 You might remember Kota Hiratsuka of Japan who creates unique origami mosaics. He sent a message to let us know his templates are now available. The trial-size, mini-template you see here sells for about 2 USD via PayPal - an inexpensive way to see if the technique suits you. Scroll down on his page to see the array of colorful, full-size designs. Be the first on your block to check out Jeffery Rudell's Paper Blooms 25 Extraordinary Flowers to Make for Weddings, Celebrations, & More. It's a brand new release from Lark Crafts. I haven't had a chance to see it in person yet myself, but am looking forward to exploring Jeffery's ideas. His creativity never disappoints and he's known for instructions that are engaging and clear. Wow. I love the CEPA video. How wonderful to see quilled clouds and paper toy trains! That's very gracious of Kota. His designs are wonderful. 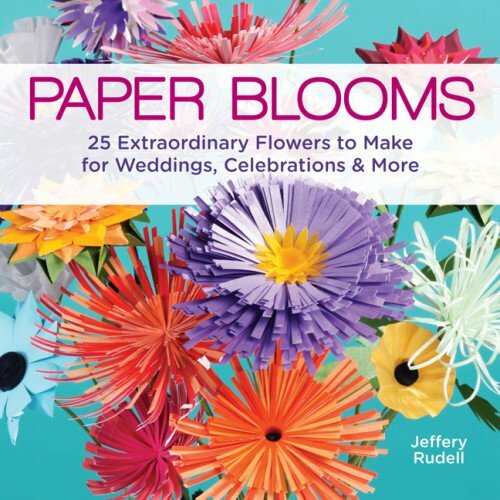 And Jeffery's paper blooms book has me wanting to make some paper flowers! Beautiful video. Nice effect the floating coils give to the video.